Re-issued with a blue label in the US. Also released with a German-only box and manual. "You start out by building your own space ship. 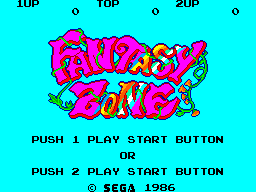 Then take off for The Fantasy Zone. 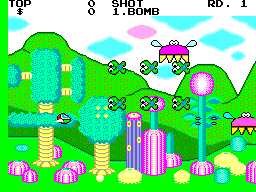 Fly through screen after screen of perilous worlds. As you try to bring peace to a troubled universe." Wait until the story starts to roll, then press Up and Down 25 times. Do this before the prologue ends, and start the game. You will now be able to buy as many lives as you can afford for $1000 each in the first shop you enter. Buy all the big engines (Big Wings, Jet Engine, Turbo Engine, and Rocket Engine) before buying a weapon. 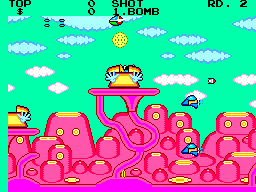 Enemy bases drop bigger coins when destroyed during the first thirty seconds of the level.